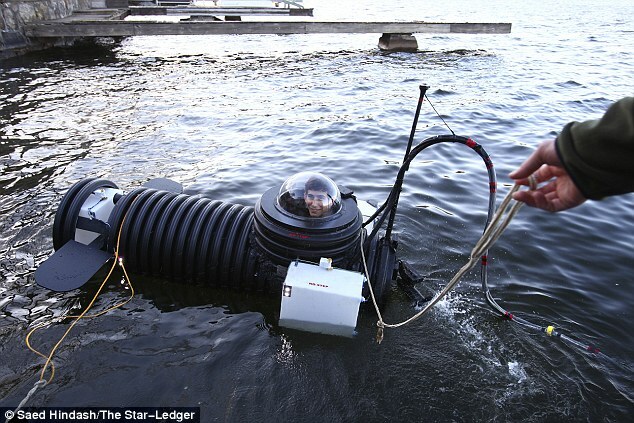 Justin Beckerman has been inventing things since he was 2 years old, and this month, the 18-year-old New Jersey boy unveiled to the world his latest creation – a fully functional one-man submarine. Beckerman, a high school junior from Mendham, New Jersey, built the underwater vessel from the lightweight corrugated plastic used in drainage pipes. The nine-foot-long, 1,300-pound submarine, dubbed The Nautilus in homage to the first nuclear sub, can dive to depths of 30 feet, although the aspiring engineer has yet to pressure-test it in the water. This entry was posted in MacGyver in the News, News and tagged student, submarine by KiwiTek. Bookmark the permalink.